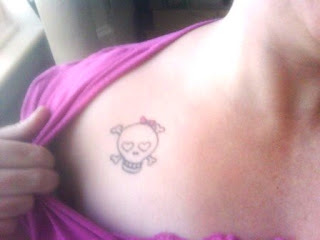 So, speaking of skulls...have you seen my new tattoo?? 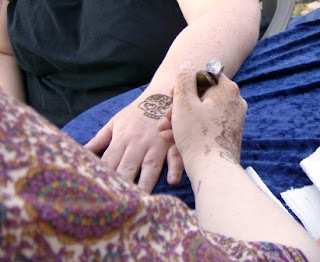 Yes - it's real, no - it won't wash off and yes - my mum already rolled her eyes. Got this done in Hamilton on August 1st and yes I love her, my little girlie skull...trying to come up with a good name for her...what do you think of Scariella (Scary Ella)?? 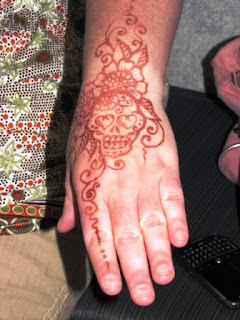 In more skull news...while I was in Winnipeg over the labour day weekend, one of the fun events planned for us was a visit from a henna tattoo artist, I had a sugar skull design done on my hand, Kim (the artist) did it totally freehand and I was totally impressed! !